Emoji is Japanese pop culture. In Japan, cell phone market is so huge that almost all generations have their own cell phone. And as in the U.S., teenagers are especially addicted to their cell phones, rarely even putting them down, let alone leaving them at home or going hours without them. 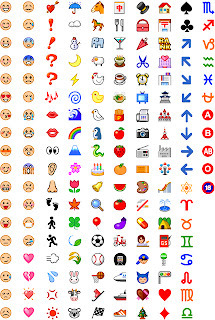 But, the Japanese teenagers, especially girls, have taken cell phone usage to another level by actually creating a separate language out of emoticons, commonly known as “emoji.” Below are only few examples of emoji available on Softbank Mobile. Japanese often use them to express their emotions, such as happiness, sadness and anger. 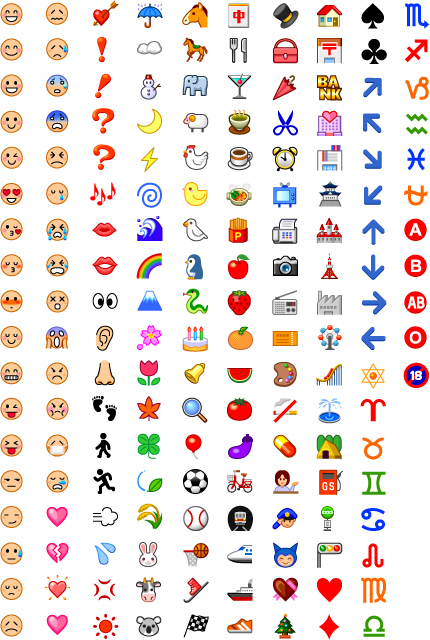 But on the other hand, they also use emoji to represent objects such as flower, trains, clock, airplane etc. Emoji has evolved as Japanese pop icons. Today, Japanese teens even decorate text messages by changing the color of backgrond, font, and inserting sophisticated special emoji which they download from special emoji sites. We often call these decorated text messages "deco-mail"(deco means "decoration"). Deco-mail can be seasonal, if seasonal deco-mail templates are used. You can also write your friends birthday messages by using "Bithday templates". Templates are created by some experts and can be downloaded via special sites. Deco-mail can be seen a form of pop art by Japanese teenagers. If you ever have chance to use Japanese cell phones, try writing a deco-mail!!!!!! !